The Angel Connection Oracle deck combines the calm beauty of nature with simple words to help you to get in touch and connect with your Angels. Pull a card, read the word and then meditate on the message you are being given by your Angels. Or ask a question and pull 3 cards to gain guidance and connect with your Angels. 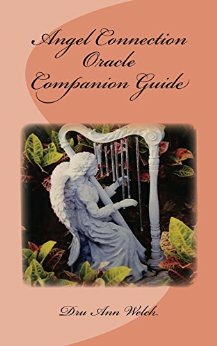 The Angel Connection Oracle Companion Guide shows each card with an expanded thought. Use it to help guide you through your day. Think of a question for your Angels, open the book and read the expanded thought. Click the photo below to purchase your Angel Connection Oracle deck or Companion Guide now!